Over at Notes in Spanish we are holding a quick competition with a 100 Euro prize for the best Spanish-learning question. I was in our local herbolario (health-food store) the other day, when I saw that there were a bunch of cards on the counter belonging to a friend of ours that has opened a yoga studio. How nice for the store owner to advertise this for them for free. It made me wonder what the online equivalent of ‘leaving a few cards on the counter’ would be. I know the web has ‘link exchanges’ (though we don’t do that), and just plain linking to something one likes (we do do this! ), but how would a friend leave a card on the Notes from Spain counter? 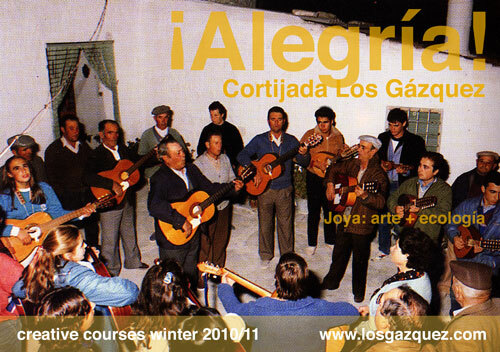 If you believe in sustainable and cultural tourism, if you believe art has the ability to make communities and individuals thrive, if you believe that a house built on profound ecological principles as a means to set an example to the world on how individuals can bring change and reverse the adverse effects of climate change and environmental pollution then become an Amigo de Los Gázquez. All we ask is that you help out with a little promotion. From time to time we will produce a new graphic image such as those you can see on the blog page (cool, tasteful and entertaining, not spammy) promoting either new residencies by artists, creative courses or eco-holidays. Click here to see what movies Apple is offering in iTunes so far in Spain – not much! This entry was posted in Spanish Culture and News on November 8, 2010 by Ben Curtis.